Set of 2 metal anchor kits with metal clamp tp clamp to base of leg. The metal clamp makes this stranger than other kits as it is clamped to the base of the leg. Black coating helps prolong the life of the anchors by reducing the chance of rust and early deterioration. Increases the safety of your trampoline. 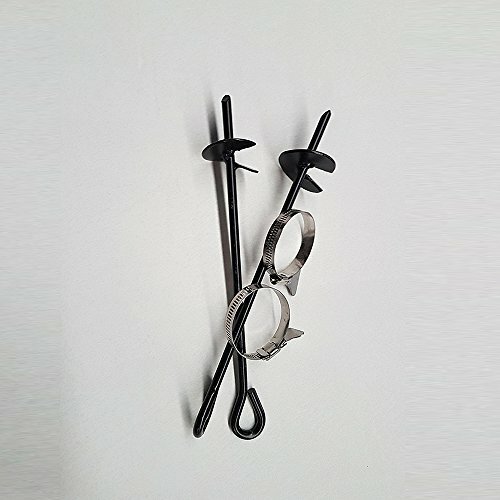 Made with metal anchor kits with metal clamp. The metal clamp makes this stranger than other kits as it is clamped to the base of the leg. Safely keep your trampoline in place during wind gusts. Set of 2 High Strength Anchor Kits. Prevents injury or damage in case of wind. If you have any questions about this product by Oz Trampolines, contact us by completing and submitting the form below. If you are looking for a specif part number, please include it with your message.